Logos generally don’t get the respect that they deserve. A logo is the first impression of your company and good first impressions grease the wheels of sales – bad first impressions are difficult to overcome. Another factor to consider when developing a new logo for a business, division or campaign, is how professional vs trendy or simply amateurish, do you want it to be portrayed? Sometimes trendy IS what you’re looking for. And, on rare occasions, amateurish is what may be desired. But most often, a B-to-B company is looking for clean, professional and intelligent in its logo. How do we know if we achieved this? A stamp-like weight: I don’t want my logo to get lost in the gray sea of text. I want the eye to be able to pick it out quickly as if it were rubber stamped onto that paper or screen. This means – don’t get caught up in loose letter-spacing. Simplified concept: Note “simplified”, not “simple”. I put my logos through many fazes of “stripping away”, so that I convey my concept with the most simple form possible. This is incredibly difficult to do while maintaining aesthetics. Maintain aesthetics: The other end of things is to have a concept-heavy logo that ignores professional aesthetics. These are usually “art directed” by committees. There’s a local hospital that fits perfectly into this category (I only assume that a committee was responsible for it). LEGIBILITY: Yes, this deserves all caps. A logo first and foremost should read clearly. Optical illusions: Not a must for any logo, but I like to make a viewer work a bit for the concept. Its a very rewarding feeling for the viewer to finally “get it” and feel as if he’s on the inside of the concept. Colors: The color scheme is extremely important to the entire future branding of the company. Colors that clash and vibrate (complementary colors) should be avoided. I also highly recommend, if sticking to a 2-color solution, to use a very dense color with a not-so-dense color, NOT dense with dense (mud), or moderate with moderate (wimpy). 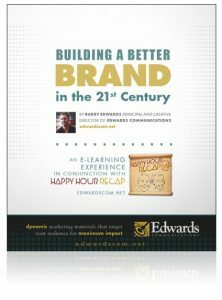 Click here to download your free copy to enhance your brand and build your credibility! I could go on about logo theory all day. It’s an art form that requires much respect… and experience. To look at these concepts in action, please see my portfolio here.